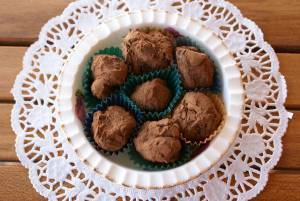 I needed to make a special little something to take to a Stamp Club meeting today and I thought of making your Traditional Chocolate Truffles (the ones you make out of cream and chocolate pieces) for the event. They turned out so nice! You can see that I didn't dip them in tempered chocolate - I just rolled them in sifted unsweetened cocoa powder - but are they ever yummy. Thank you so much for providing a simple and easy recipe for me to use - one that turned out right the very first time I tried it! I love Chocolate Candy Mall. They look absolutely wonderful. Thanks so much for taking the time to show them off for us. I do love the simplicity of this recipe. By skipping the tempered chocolate coating, it's even easier. Cocoa powder was a nice choice for coating, but there are so many variations that you could choose - coconut, icing sugar, non pareils, crushed nuts, toffee bits, etc. Having a great time visiting my family in the States, but miss all you guys back in Oz. Hope you are all well. Take care and always remember we love ya over here!